After five inspiring and challenging years, we will be concluding the Maker VISTA program in Fall 2018. To celebrate the impact of this work, we’ve asked our amazing Maker VISTA members to reflect on their experiences and accomplishments this past school year. Each of our VISTA members, working at various partner sites nationwide, came to this program with different perspectives, and focused on different projects—yet they all remain connected by a commitment to service and community. 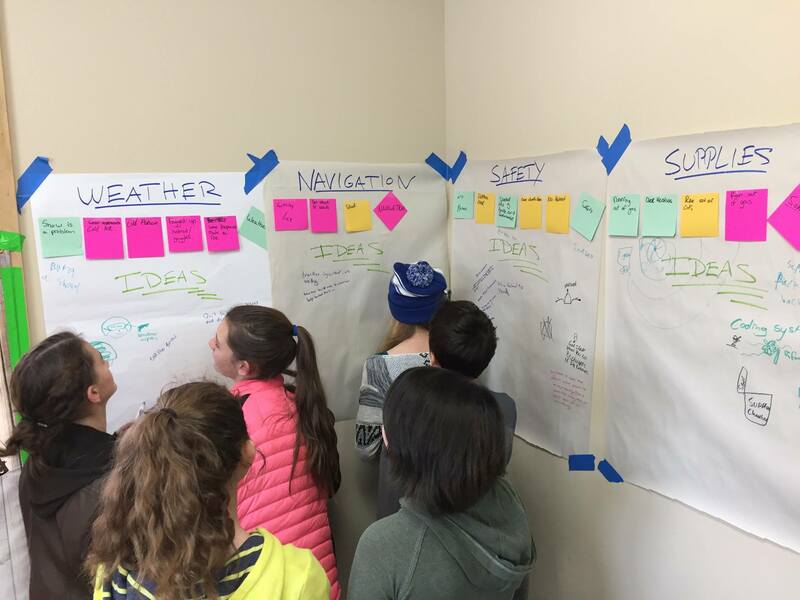 In this post, Jesse Hunt, a VISTA member who recently completed his year serving at Salmon Public Library in Salmon, ID, shares more about how he, and the youth and educators he served, have been affected by maker-centered learning and capacity building. 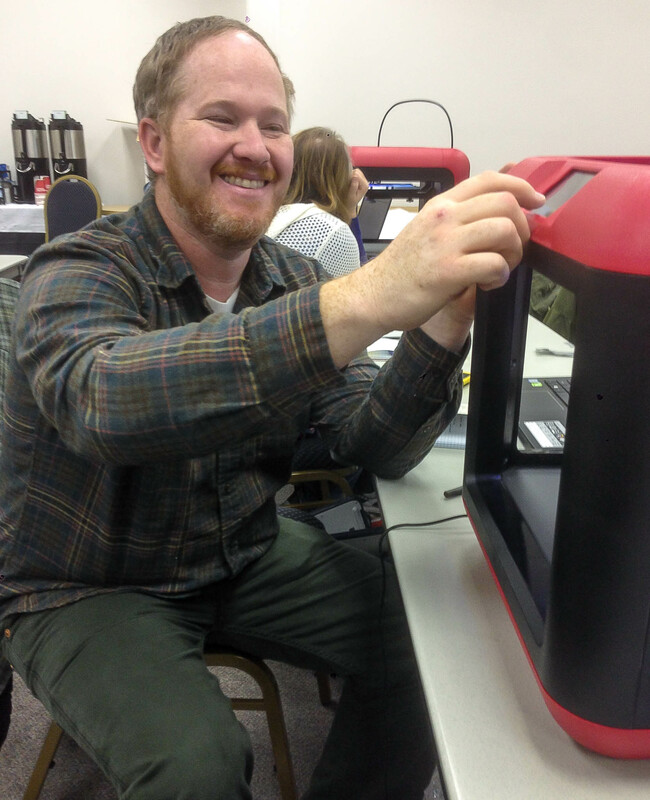 Jesse, the author of this post, works with a 3D printer at Salmon Public Library. Throughout my career as a recreation therapist, I have sought to push boundaries and have always sought to practice innovation in the things I did for others. Since leaving that career to be an Americorps Vista working with the Salmon Public Library to create a new makerspace, I have had the pleasure of placing innovation at the forefront of my work. This year of service has been a step outside of my shell, where I got out and helped create community relationships, and in doing so I have started to see community as the solution to solve the unique challenges people face. One of my favorite experiences was going into multiple classrooms to point students in a direction of living a creative life, and thinking differently about how to solve problems. I was able to share my personal passion for a principle called Design Thinking. One of its central elements is that of “empathy” as a key to unlocking a world full of challenges. When we start with the heart, you will make a difference in the world. I will take what I have learned and desire to use the lessons of this year to keep making bold actions in my personal life and the communities I live in. One morning in July, at a “Summer STEM from Your Library” event in a Salmon community park, a little girl stamped her feet, crossed her arms and told me in no uncertain terms that she was “NOT going to hammer” her own nails into the tin cans we were using to make telephones. Whether she believed it was unladylike for a girl to handle a hammer, or simply that the plebeian task of hammering was beneath her, I could not say for sure, but I was reminded that being offended by the things that scare us is a behavior that starts young. At the end of a year of VISTA service in maker education, I believe more strongly than ever that making is a process of developing agency—there’s a fine line between pushing a child to do the thing that scares them and sending a message that their needs and desires don’t matter. I did not make the girl hammer that day. But when her partner, a younger girl, issued a tentative copycat objection, I did insist—and she met that hammer with laser focus and the wickedest grin. Young visitors at Salmon Public Library participate in a brainstorming session. Saying I went to rural Idaho to pursue a career in progressive education sounds a bit like saying I moved to Los Angeles to pursue my passion in home canning, but that’s actually what happened (the former, that is—I have yet to master home canning in any location). It is true that Idaho’s education system ranks 48th among 50 states and the District of Columbia, with correspondingly low weekly wages and high poverty rates. It is also true that to thrive in Salmon, and a number of small towns like it, you need a maker mindset. Salmon is genuinely a place where people make daily. They make meals, from food they raise, hunt, grow and gather themselves. They make furniture from wood and leather. They forge tools. They sew. They weld. They make soaps, salves, lotions and decor to sell at local markets. They make do with what’s available when a 6 hour round trip is out of the question. This is a way of life that is, to some extent, threatened by modern technology and our on-demand economy (yes, we have Amazon Prime in Salmon). There are many young people I have met during the course of my service who are not learning the skills their parents and grandparents relied on to survive. Nor are they learning new skills to take their place. This is where maker education becomes increasingly important. Salmon, like many small, rural towns, is wary of change. But change will happen, whether we want it to or not. As a maker educator in Salmon, I have come to understand my role as empowering individuals to be agents, rather than victims, of that change. Over the course of my VISTA year, what I have found in making is an antidote to helplessness, and a way to teach self-efficacy and self-sufficiency to the next generation. At a time when people are hosting prayer vigils for our nation and so many of my peers seem to walk around with a vague, but constant, sense of doom, we need the solutions maker education has to offer us.